Spacious living room and kitchen area for entertaining Entrance to condo 129 Entry Spacious living room with gas fireplace Spacious living room with gas fireplace Kitchen with granite counter tops and upgrades throughout Cozy Dining Area Master Bedroom with a King Bed Master Bedroom with a King Bed Master Bathroom Second bedroom with a king bed Downstairs bonus room / Den with large flat screen tv Downstairs bonus room / Den with large flat screen tv Third bedroom with a king bed Third bedroom with a king bed Twin beds in the 4th bedroom Twin beds in the 4th bedroom Second Bathroom Private deck with outdoor furniture and BBQ over looking the woods Private deck with outdoor furniture and BBQ over looking the woods Entrance to Mountain Harbor, located at 1750 E. Lakeshore Drive E. in Whitefish Stop in and say `Hello` Splash in the pool. Get your game on- Play Tennis Tennis Court Birds-eye-view- Beautiful Mountain Harbor from the Lake Mountain Harbor Map of all Lakeshore Rentals Properties Mountain Harbor offers so many gorgeous views- just walk around Take a nice walk down to enjoy Whitefish Lake Enjoy the sound of the running stream Walk the path next to the stream. Condo #129 is the largest of the Mountain Harbor rentals and has 4 bedrooms and 3 bathrooms. It has been recently completely remodeled to include top-of-the-line stainless steel appliances, granite countertops in the kitchen, and walk-in tiled showers. 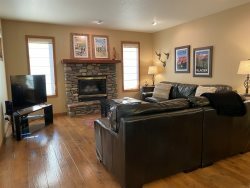 This vacation home has a large living room with river rock gas fireplace, large flat screen TV and French doors that open to the spacious covered back deck and BBQ area and Master bedroom with a King Bed and full bathroom all on the main floor. Downstairs you will find a den/office with another Flat Screen TV (perfect for the kids!) and 3 more bedrooms all very nicely appointed. Mountain Harbor is in a great location on Whitefish Lake; only 6 miles from The Whitefish Mountain Resort for Alpine and Nordic Skiing in winter or in the summer enjoy hiking, mountain biking, zip lining and Tree Top Walks. A 2 mile walk on the new footpath/bicycle path is a very popular way to access Downtown Whitefish for a morning coffee or breakfast at one of the many local restaurants. Fine dining or family dining is in plentiful abundance in Whitefish....spoilt for choice from sushi to steak. You can view our Top Picks by visiting our Local Area Guide for staff suggestions on things to do and places to eat and don't miss visiting Glacier National Park, a short 35 minutes away from Whitefish with all the hiking, biking, water rafting, fly fishing and family fun you could every dream of. Mountain Harbor is a family friendly lodging choice for reunions and weddings. With around 20 condos of varied size in one small resort there's plenty for everyone. Mountain Harbor has it's own outdoor swimming Pool open in summer months and an outdoor community hot tub open 10 months of the year, especially summer and ski season. The Mountain Harbor beach is one of the best on Whitefish Lake with 405' of private lake access. Fire pit at the beach and a tennis court and basketball hoop are some other amenities to please all ages. Very nice! We would stay again for sure!! Great place! Perfect for 4 people and families. Thanks! !